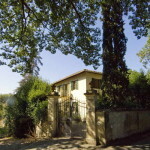 Vineyard and tourism business for sale less than half an hour from Florence consisting of Chianti Classico wine estate with period manor villa, agriturismo, restaurant, wine shop, winery and private Hunting Reserve. 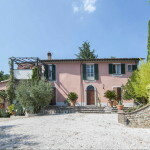 Among olive trees and vineyards, this exclusive Tuscan wine estate is placed in a hilly location in the heart of the famous Chianti Classico wine region, only a few kilometres from a Tuscan town with shops, restaurants and services. The most beautiful towns of Tuscany, like Florence, San Gimignano, Monteriggioni and Siena, are all within easy reach. 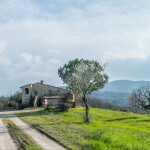 The property is set in a convenient location, ideal for the business, only few kilometres from the A1 motorway, that allows you to reach Arezzo in less than one hour, and just 36 km away from the nearest airport, Firenze Peretola. Surrounded by a fenced parkland, the property is composed by a 19th Century period manor villa, a farmhouse and a villa, currently running as Agriturismo, a restaurant, a shop and a wine cellar. Arranged on two levels, plus a basement floor hosting a barriccaia, it is composed of a reception room, two spacious lounges and 9 master bedrooms, each with private bathroom. 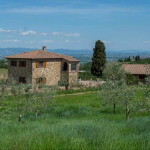 The villa boasts a panoramic turret, overlooking the surrounding Tuscan countryside. It contains a barriccaia on the basement floor; on the ground there are a shop, a restaurant room with 45 places, a professional kitchen and rest rooms ; and on the first floor there are five bedrooms and four bathrooms. Part of the production of the estate, like wine, extra virgin olive oil and saffron, is directly sold to the costumer in the shop. Divided into small apartments, it hosts on the ground floor two units, each composed of kitchen, two bedrooms and bathroom; and on the first floor two bedrooms and an apartment housing two bedrooms and two bathrooms. In front of the manor villa there is the wine making cellar with storage and outdoor fermentation area. Tastefully restored maintaining intact the original features of Tuscan farmhouses, the country house features wooden-beamed ceilings and terracotta flooring. The nineteenth century manor villa boasts bright and airy rooms with high ceilings, doors and windows with stone portals, and vaulted ceilings. Surrounded by a lush garden with swimming pool, the estate boasts 21 hectares of land, of which 13 of vineyard, 6 of woodland and 2 of olive grove, and a fine cultivation of Saffron. Cultivar: Sangiovese (90%), Cannaiolo, Trebbiano, Cabernet Sauvignon, Merlot. Annual production: Hl. 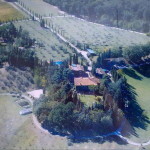 1.300 / 1.400 of wine, of which n. 20.000 – 25.000 bottles are directly sold by the Wine Estate, and the remaining wine is sold as cask wine to one of the most prestigious wine producers of Tuscany. The bottles of wine are exported mainly in the USA, China and UK (London).